Insert the racking cane into the beer all the way to the bottom. Try to avoid stirring or agitating the sedimant on the bottom. If using a clamp, kink the hose below the clamp and release the clamp. Now the flow can be controlled with how tight the kink in the hose is held. 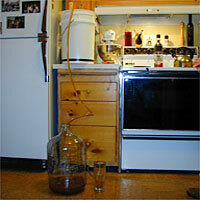 Before siphoning the beer to the secondary fermenter, have two glasses ready on the floor. One glass is used to purge the water from the siphon hose. Once the water has been purged, the second glass is used to collect a sample of the beer for testing. Only a few ounces are needed. 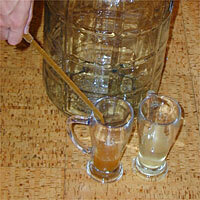 After the test sample has been collected, the beer is ready for transfer. Insert the siphon into the secondary fermenter, and make sure that the end reaches the bottom so that no splashing occurs. 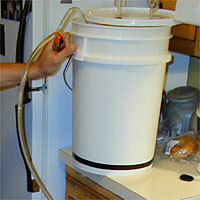 The beer should flow from the primary fermenter to the secondary fermenter within about ten minutes.